Vegetable product is classified into protective foods group which all citizens in general like to eat, which nowadays those vegetables are in need and they are imported from neighboring countries. In vegetable production process, there are many kinds of varieties, and our farmers never consider the season in which their product can be sold at high price, that is, after the harvest, they will continue the cultivation. Thus, those farmers will loss. In each region, there is little vegetable crop land, and farmers with most cultivating opportlessony are those living around Phnom Penh city. Cambodian citizens as well as people all over the world are regularly in need of vegetables to eat. Our farmers currently decide to improve vegetable productivity in order to respond to the growth of population that increases over time. No matter how hard female and male farmers work to produce, however, there is still insufficiency every year, especially, in Chinese New Year season. Thus, sellers contact others to import vegetables from the neighboring countries in order to serve the demand of clients. Since vegetable is insufficient, citizens are working hard to produce vegetable so as to get high crop yield, and also reduce the use of poison and chemical fertilizer in order to ensure citizens’ well-being. Some citizens who are doing farming can solve their living, and some could do some small business, but vegetable insufficiency issue still exists. All vegetables producing, since technical skills hasn’t been promoted to citizens, they haven’t considered about the selection of seeds, growing, and caring properly, which leads to failure our crop cultivation. Thus, Agricultural Development Commission has compiled the document on vegetable crops in order to help farmers to get success, and to supply to markets across the whole country sufficiently. 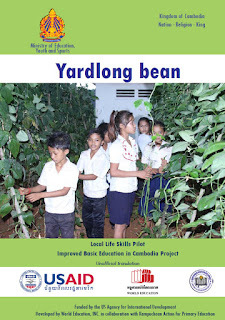 Document on “Vegetable Crops” aims at helping the learners to gain knowledge, skills and experiences in simple life-skills which plays important role in agriculture production for our families. The study of how to grow vegetable in the early age has linked the needs with priority and objective, and helps adults to avoid facing unemployment caused by lack of knowledge in agriculture production. We hope that youth today may think with plan and goal on vegetable crops such as: planning, budget planning, materials, and following through important steps in order to make this business develop in all families.